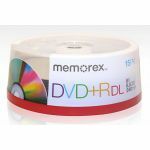 supports DVD-R or -RW format. 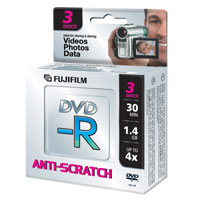 The 8cm DVD-R has “antiscratch” coating on the recording surface to make them easy to handle. - “Anti-scratch” coating offers protection against scratches caused by mishandling or wiping the recording surface. It also makes the surface easy to clean. - Recording time / mode : 20min./ HQ mode, 30min./ SP mode, and 60min./ LP mode. - Supports recording speeds up to 4x. - Available in hang-tab box with 3 pcs.